As a leading cup handles UK supplier, Häfele ensures that the large collection we stock encapsulates all price points, materials and finishes you may require. Cup handles are a hugely popular handle choice for furniture, as they are so versatile in application. We understand the importance for you to be able to shop for great value for money cup handles in one place. 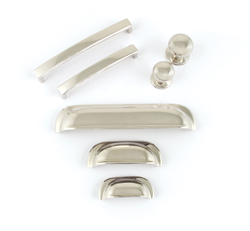 Häfele really is a one-stop-shop for all your cupboard, kitchen and cabinet handle needs. The Häfele collection of cup handles fits into various families; we have selected some highlights below from a range of price points, which represent the breadth of the collection. Our Mulberry family is part of our ‘Best’ range, and is one of the most elegant and sophisticated finishes we offer. Perfect for both high-end commercial and residential use, the refined finishing touch of these cup handles is second to none. Available in Polished Nickle and Rubbed Bronze, this collection is unfailingly durable and is available without the high-end price tag, with Trade List Price at only: £8.78. 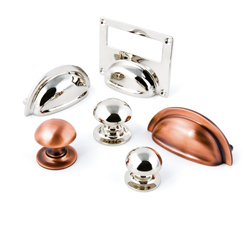 The Chatsworth Cup Handle range is available in the on-trend Polished Nickel finish, which is perfect for bathrooms, or the beautiful brushed copper which is a progressive trend for the consumer-favourite painted kitchen cupboards and drawers. These cup handles are competitively priced at only £17.47 Trade List Price. Part of our ‘Best’ collection, you can trust that these handles won’t let you down, as they are made from heavy brass and built to last. As part of our ‘Best’ range, the Lamont cup handles are one of our most reliable and competitively priced products. The entire Lamont family is crafted from solid Pewter (the fourth most precious metal) which many assume gives it a high price point, however the cup handle is priced at only £11.60 Trade List Price, giving you an exceptional handle with equally exceptional low cost. 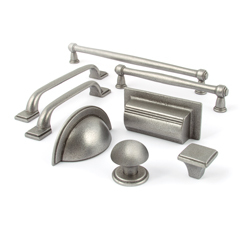 Pewter has been used for centuries due to its consistent durability and unbeatable reliability. Whilst this is still true, our Pewter range not only provides this uncompromising quality but stunning contemporary design. Giving an industrial edge to a chest of drawers or cabinets, this Pewter cup handle is the perfect addition to a modern residential project and even suits stylish bars and restaurants. The Burlington family is part of our ‘Better’ range, offering superb quality at an even more wallet-friendly price point. With all the industrial design qualities of the Lamont family, the Burlington cup handle is made from cast iron, a softer material than the pewter used above. At a bargain £2.40 trade list price, this cup handle is specifically designed to be a more subtle finishing touch, drawing together key pieces of furniture without breaking the bank. 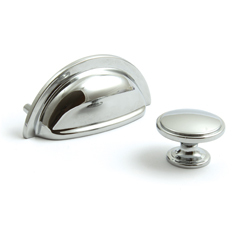 The Henrietta cup handle is available in polished chrome or brushed nickel, both very attractive finishes. 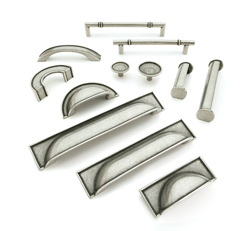 This family of cup handles and knobs is one of the most economical options Häfele stock, offering a stylish product for a fraction of the cost of other ranges. As part of the ‘Good’ cup handle range, this finishing touch is yours for less than £1.20! To view the Häfele collection of Cup Handles, please visit our Cup Handles Section by clicking here. Whether you are looking for Cup Handles for Kitchen Cupboards, Drawers, Cabinets or even Bathroom Cupboards, you can be sure that you’ll find exactly what you’re looking for in our Decorative Handle directory.